So which proposal does everybody think they should go with? Its been awhile since I regularly drove the Hampton Roads area, but isn't the HRBT only four overall lanes? That bottleneck should certainly be expanded. As far as the third crossing goes, I always thought that it was a pipe dream more than anything else. Some of the ideas they've come up with so far are a high deck girder bridge, or a quadruple-tube tunnel. I don't really care as long as its more than 4 lanes! That is an awful sight! What do you mean they freak out and people having to come get them? People panic in the tunnel and crash into a wall or another vehicle usually, but sometimes they do just freak out and stop. Us locals call it "Tunnel Terror Syndrome." Oh, and when they actually drive all the way through it, they usually don't even make it over 30 mph. I guess if you've never been through one in your life before... but when we have a total of 6 tunnels around here... its nothing unusual. Has your CMSA been voted #1 for worst traffic congestion bottlenecks by many organizations for several years now? no? Didn't think so. But we are the 13th largest US metro area by population and a city of 500,000 is stuck with 4 ways out, 2 being the bridges. See the WSDOT AADT numbers for more INFo. And petition your local government if you think it needs to be fixed. If you get enough support they might listen. ... and a metro area of 4 million has only one way in or out from each of the directions, so if a bushfire knocks out the north and south (as well as the west), we're screwed. This brings up a good point about cities with few ways in and out, and I'll start a new thread on it. I'd never heard of people flipping out in tunnels. I lived in Boston for many years, which had the Summer and Callahan tunnels, and later the Big Dig. Never heard of it having to get shut down because someone just plain stopped. It's not as common as people wrecking in the tunnel or anything, but it has happened before. 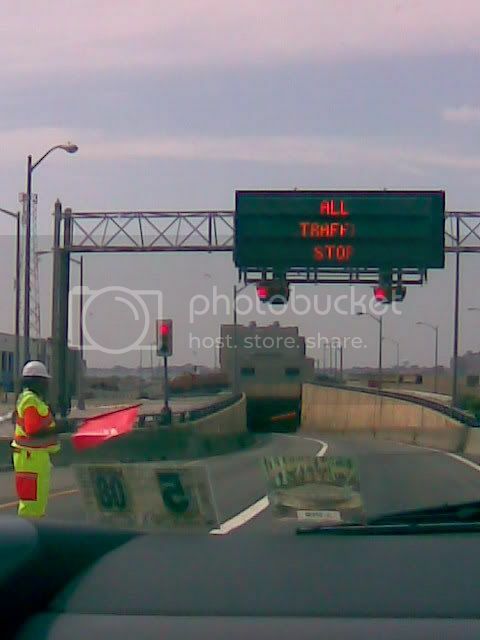 why don't they put the overheight warning before the last exit before the tunnel? does the MMBT have these same kind of problems? From what I recall of VDOT statistics, it happens several hundred times a year (at least twice a day) on average. As I mentioned before, it's the single biggest cause of traffic stoppage at the HRBT. Hmmm... I guess I've just missed every single example of that happening. And if froggie's statistics are correct, rawr, then it should too. Highly doubt anything EVER happening. Have to agree, a new 460 is a better idea. Upgrading US 460 is a much better idea than the Third Crossing, and would probably eliminate the need for it. US 460 is already an ideal truck corridor to South Hampton Roads. I doubt it would eliminate the need for it, but it would certainly reduce it. The federal government should provide at least 50% of the funding in special funding above normal FHWA funding formulas. Why? Because of the massive military presence in the area that greatly increases road traffic, and the U.S. Navy's insistence that only a tunnel can be built under the shipping channels on Hampton Roads and the Elizabeth River, which makes a facility's construction cost about double the cost of a high-level bridge. I am aware that there have been new bridge proposals recently, but I don't believe that the Navy will ever agree to it.